Ballymena United assistant boss Lee Doherty and manager Glenn Ferguson have called for greater consistency from their players. 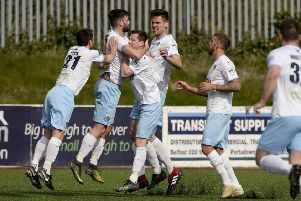 Ballymena United’s players and staff share the frustration of the club’s supporters over the Sky Blues’ inconsistent league form. That is the view of United assistant manager Lee Doherty as United’s efforts to climb the Danske Bank Premiership table continued to be thwarted by patchy form. United looked to be on course for back-to-back league wins at the weekend, only to let a two goal lead slip in a 2-2 draw at Carrick Rangers. “We seem to be a team capable of getting to semi-finals and finals but we need to be much more consistent in the league, week in, week out,” said Doherty. “It’s not a concern where we’re saying we have to change this and that - it’s just frustrating that we’re not picking up the points our performances merit. “Good players perform every single week to a certain level. It’s frustrating when you see players so well and then not reach that level again. “Let’s try to pitch it at a seven or an eight out of 10 every week - the likes of Jim Ervin plays well all the time. “He’s not the star player in the team but he plays well all the time and we need more players to look at their performance and say ‘I’m not going to drop that standard’. “It’s not about getting ready when you get to the ground. When training finishes on a Thursday night you should be starting to focus on Saturday, eat on a Thursday what is going to fuel you through on a Saturday, then wake up focused on the Saturday and ready to win your own battle,” added Doherty.